** Note (8/29/18): Town is incrementally rolling-out this new program. Soon you will be able to report other service needs, so please bookmark this link! Mark Envelope: "Cutting, Clearing, and Removal of Materials from Project Site Proposal- Attention: Andy Benke"
All dogs visiting the Island must have a dog permit and dogs should wear the Town issued collar while on Sullivan's Island. Permits and collars are available at Town Hall (2056 Middle Street). Call (843)883-3198. Questions/Concerns? Report online with 3-1-1 (Click) or call Town Hall (M-F) at (843) 5743.
and download "SCDOT 511" application on your smartphone. Effective January 2019, Dominion Energy has merged with SCANA. The SCANA and South Carolina Electric & Gas are now known as Dominion Energy. CLICK HERE to view a fact sheet about the merger and what to expect in the coming years. S.C Law provides that it is a crime to knowingly obtain or use personal information from a public body for commercial solicitation. 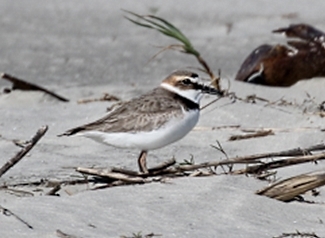 The Town of Sullivan's Island has joined with Sullivan's Island Elementary School, Edgar Allan Poe Library of the Charleston County Public Library system and the SC Audubon Society to raise public awareness of the Wilson Plover on Sullivan's Island and help educate the public on ways to co-exist and protect the birds' habitat. Resident and visitor tools and tips for co-existing with coyote wildlife on the Island. Please help the Town - Report all coyote sightings! The Town does not encourage you to physically engage a coyote. If at any time you feel in danger, please call 9-1-1 for emergency assistance. Reporting each and every sighting provides the Town necessary data to track coyote habitats and behavior patterns. This information is critical to the Town's regular review of its coyote management strategies. Thank you for your assistance. NOTE: The preliminary maps are provided for public information only. Current Sullivan's Island flood maps remain in effect. DO YOU NEED A RECYCLING BIN? All-in-one large recycling carts are delivered to your door directly by Charleston County Recycling. Charleston County Mosquito Control is striving to educate residents on steps they can take to"Fight the Bite" (click here- link) and urge residents to call their offices to report any and all mosquito concerns. A quick call to their offices will help the department track issues and ensure Sullivan's Island remains high on the mosquito abatement spray list. County Mosquito Control is (843) 202-7880......Click Here for web page.